“Are we having funnn!” implores “The Legend” . “Yeaah,” chant the dancers. “You little beauuutees,” cries this country’s first rock’n’roll star Johnny Devlin. “We” are at the Levin Cossie Club at Johnny’s Shake Rattle & Roll Dance Show. About a dozen dancers, including photographer Janet Bayly and myself, are on the dancefloor. A trio of Johnny’s female contemporaries are having a helluva good time dancing together. Two pairs of dancers are pretty slick, knowing all the old moves, and a group of women from the Levin Singles Club are swinging. We’re again set into motion by Little Richard’s “Tutti Frutti”. “Little beauty”, sings Johnny, Aussie-twanged. He’s taken us through Bobby Seger’s “Old Time Rock’n’Roll”, Bill Haley’s “Rock Around the Clock”, Fats Domino’s “Blueberry Hill”, his own “Straight Skirt” (“a big hit in New Zealand on 1YA in 1958”), Cheap Trick’s remake of Elvis Presley’s “Don’t Be Cool”, John Lennon’s (“I knew him well”) “Imagine”, Elvis’s “Heartbreak Hotel” (“I haven’t done a show without paying tribute to the man. I was, you could say, New Zealand’s first Elvis impersonator”) a Buddy Holly bracket, his 1958 “Lawdy Miss Clawdy” (“one of New Zealand’s best-selling records”) and “Rock’n’Roll I Gave You the Best Years of My Life” (“which I recorded on the occasion of my 60th birthday”). “Not bad for a 62-year-old rocker, eh!” Yeah, Johnny, not bad. Sometimes the tune was elsewhere, but the songs were given a sexual energy by a man who just loves performing. He’s done it over 2000 shows in the last ten years alone. On the previous Wednesday he performed at Palmerston North’s Metlifecare retirement village, where his 90-year-old mother Bessie lives, and was backed for the gig by Palmy duo Brandy and Dry, which includes his cousin and best mate Tony Mercer. (“When they have drummer, they’re called Brandy and Dry and Ice”). “I stay with Tony and his wife June whenever I’m in New Zealand,” says Devlin. “Tony’s like a brother to me. We started off when I was about 10 years old in Wanganui when we formed a little country and western group called The Rivercity Ramblers. There was my three brothers and Tony. We went round all the areas . . . talents quests, charity shows and cleaned up quite a few. 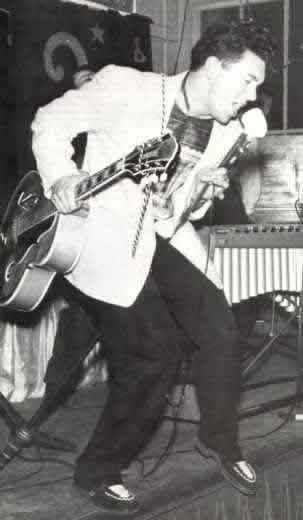 “And as rock’n’roll came in, Tony and myself started singing rock’n’roll and I started imitating Elvis. When I first heard Elvis I thought he was incredible and when I heard “Heartbreak Hotel” I felt this is for me. “So I bought every Elvis record I could get my hands on and I dressed like him. What I saw in magazines. I had a ming-blue coat, white stovepipe pants, blue suede shoes, and I practised all the movements in the mirror. I learnt to play the guitar and I went round all Johnny Cooper’s talent quests and won most of them. Did he what. “1958-59 was when everything happened for me in New Zealand. It was like the Elvis Presley hysteria thing overseas, but on a smaller scale. They used to mob me and rip my shirts off. It was the press that got me going in New Zealand, because there was no television. And even though I was starting to record, the NZBC didn’t think the recordings were up to scratch, so we didn’t get much airplay at the start. “But then we went on this big six-month New Zealand tour through Robert Kerridge’s venues, and we packed out, packed out, packed out. And I kept doing record shop appearances and as a result we sold in access of 100,000 copies of ‘Laudy Miss Claudy’, my first record. Devlin went to Australia 1959 and established himself there, while always making sure, he points out, that he was introduced as “New Zealand’s King of Rock’n’Roll”. Over the years he has been billed with artists such as The Beatles, Abba, the Everley Brothers, Conway Twitty, Chuck Berry, Rick Nelson and Fabian. He’s had 15 hits on the Australian charts, including “Turn The Lights Out Johnny”, “Doreen” and “Gigolo”. He has written, he says, 23 hits for himself and others: his instrumental “Surfside” became a No 1 hit for the Denvermen. In 1998 he celebrated his 40 years in showbiz with a nationwide TV show. And family? “I’ve two grandkids (six and nine) and two daughters (36 and 38). Their mother made sure they didn’t get involved in showbiz. She was a model. She didn’t like showbiz that much. The highlight of his career, says Devlin, was probably the 1964 Beatles Australasian tour – “because there were so many big-time entertainers in Australia that could have got that tour. Brian Epstein and Beatles press secretary Derek Taylor were so impressed with him, he says, that Taylor was going to bring him to England for him; but the plan fell through when Taylor broke with Epstein. Devlin went anyway “and I did extremely well there. I got a three-year recording contract with CBS Records. I did my first television show on Jukebox Jury and one of my records made the top ten on the Radio London charts from the pirate ships. Favourite gigs? “The biggest live audience that I’ve ever sung to was a million people. That was on Australia Day on the bicentennnary at Darling Harbour. We were on a float on the water like a soundshell. There was a million people all round the harbour. And they had these big television screens. That was a good gig.